Our next guest has been examining that set of questions, resulting in an exclusive for The Nation magazine. 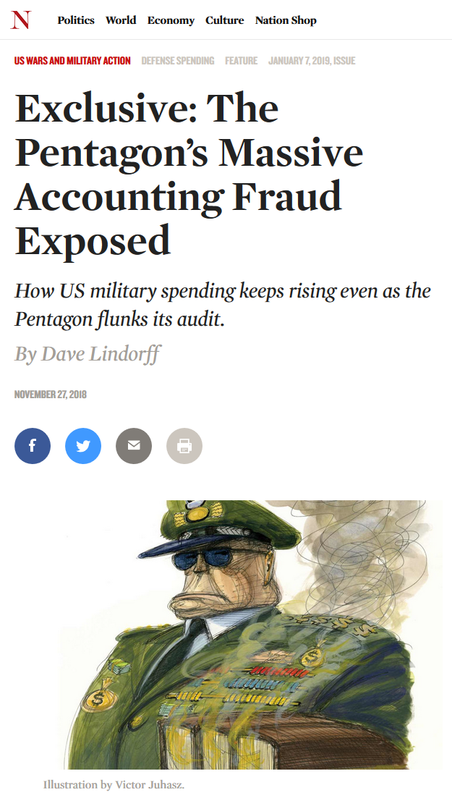 The story’s called “The Pentagon’s Massive Accounting Fraud Exposed: How US Military Spending Keeps Rising Even as the Pentagon Flunks Its Audit.” He’s called Dave Lindorff, longtime investigative reporter and author. 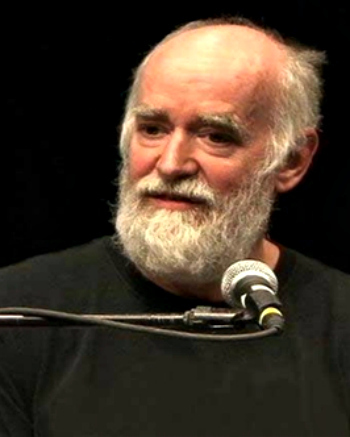 He also writes for Salon, the London Review of Books and Tarbell.org, sometimes for FAIR.org as well. He joins us by phone from Philadelphia. Welcome back to CounterSpin, Dave Lindorff. Dave Lindorff: Hi, Janine; thanks for having me on. Yeah, actually, I first got on this story for an article for FAIR back in 2016, when I saw a number in the alternative press about the $6.5 trillion expenditures in the Army budget of that year’s Pentagon budget, which was only about $500 billion, and I thought, “Whoa, what’s that?” And then I started wondering why it wasn’t in any of the mainstream media. So I did a little exploring as to what it was in the article, but the main point of the article was that it just wasn’t being reported in the corporate media. JJ: Well, and I’d like to hear some more history on that, because I’m reading about the Pentagon’s first audit. And that doesn’t—how can that be true? DL: Well, in 1990, Congress passed a bill called the CFO Act, which said that every federal agency had to have an auditable budget, and had to submit to annual audits from outside auditors. And by somewhere around 2015, I think, 2014, every agency in the government did, in fact, have auditable budgets, and was being audited externally annually—except for the Pentagon, which has steadfastly stonewalled against making its budget auditable, or even comprehensible. And finally, after years and years of stonewalling—which was called out as stonewalling, by the way, by Chuck Grassley, senator from Iowa. He actually said in a hearing last year, that he told the comptroller for the Pentagon that he was pretty much of a mind that they must, at this point, not want to be audited, and be deliberately stalling. Which, I agree, is true. So anyway, the Congress came up with last year $900 million to fund an audit, whether the Pentagon wanted it or not. And so for the past year, 1,200 outside auditors, headed by Ernst and Young, went over all the books. And on November 15, they reported that they couldn’t do it. The numbers were so screwy and impenetrable that they couldn’t audit the Pentagon. Deputy Secretary Patrick Shanahan came out to the press and said: We had an audit. We failed it. And we thought we would fail it. And then he said, But we should get a lot of credit because we even attempted it. Well, the media reported that, and his words saying they should get praised for what they did. And none of them bothered to point out that they’ve been stonewalling for 26 years, so they don’t get any credit at all. JJ: Yeah, they almost made it sound as though, “Yeah, you know, they’re right. It really is complicated.” You know? JJ: As though that somehow excused it. Well, I mean, we can come back to media, although media certainly thread throughout this story. But in terms of the research that you did, and that you were able to hook into, what did you uncover when you yourself went through that audit and talked to folks? DL: I started out with the numbers that were found last fall in a report by this professor from Michigan State University, Mark Skidmore, and two of his graduate students. They looked at all the reports of parts of the Pentagon budget, done by the Pentagon’s Office of Inspector General, over a period from 1998 to 2015. That’s an internal auditor monitor of the Pentagon. Every federal agency has an office of inspector general. And what they did was, they would look at a part of the budget, like maybe one year it was the Marine budget, one year it was the Navy budget, one year it was the Air Force budget, one year it was the Army budget. Then they cycle around and they do other parts, too, of the Pentagon budget. But they never do the whole thing. And just those parts had these screwy numbers, that were called “plugs” in Pentagon jargon, I found out. And they plugged these numbers in, ostensibly to make things balance out or something. But the numbers are really screwy there, sometimes in the trillions of dollars. And there’s never been a Pentagon budget more than—I think the highest it ever was, at the height of the Iraq war, was $800 billion, so not a trillion dollars. And they had ones that were as high as $6.5 trillion, $11 trillion, you know, really crazy numbers. And the total, for over that period, that they added up was $21 trillion, which is as much as the whole entire US debt in the history of the country. JJ: And that’s money that’s just…. It goes in, but doesn’t come out? You can’t trace it? What do you mean when you say, there’s trillions of dollars, and yet the budget is only billions of dollars? DL: Well, as Mark Skidmore points out, we don’t know what the hell it is, because there’s no explanation for the numbers in any of the inspector general’s accounts. They just say, “These numbers aren’t supported by ledger entries.” And they say, “This has to be corrected.” Or, “You can’t do this again.” And then, of course, they do it again the next year. But it makes the budgets unreadable and meaningless. So we don’t know whether those are real entries for real money that’s coming in. It’s money going in and out; it’s on the positive side and the negative side, the assets and the liabilities. So you don’t know whether these are real secret money coming in that’s not appropriated by Congress, although I tend to doubt it. Some of it might be. Mark Skidmore says, we don’t know. He says, maybe it is real money being printed by the Fed or something. Or maybe some of it is real money that’s being slipped to them from some other source. Or maybe, what I think it is and what my sources in this story say, is that the numbers are made up, and they’re meant to make the budgets unreadable by anybody, and unauditable. Chuck Spinney, the whistleblower famous in the ’80s for really exposing Pentagon corruption and fraud, said that he thinks the goal is to paralyze Congress and paralyze the media, not to be able to ask questions about the Pentagon budget, because you can’t understand it. JJ: Let me just put a pin in the fact that you just named Chuck Spinney; he’s one of the sources that you rely on. You’re not talking to folks who are just making random guesses. Your sources in this story are folks who are insiders, who are close to this kind of of accounting, and they are folks who are going on the record. And they’re saying that a lot of money, its source and its destination, is just not available. And at a certain point, it starts to look less like accidentally sloppy bookkeeping, and an actual—I mean, forgive me if I’m underscoring this too hard—but an actual intent to avoid accountability on the Pentagon’s part. And that’s important. I mean, we’re talking about $717 billion, which is 54 percent of the discretionary budget for the federal government. It’s 54 percent of the taxes that every American pays to the federal government, is being totally unaccounted for, and is going to Congress in the form of garbage, when they have to look and see what was done with the money that was allocated in the prior years. And the worst part about it is that that’s being used to justify the next year’s appropriation, for the next fiscal year. So I just think if this were happening in the Department of Health and Human Services or in the EPA or the Department of Labor or the Department of Education, there would be calls for hearings, subpoenaing of secretaries under oath, there’d be Justice Department investigations. And there would also be investigative reporting by the mainstream media. But nothing about the Pentagon, when this was happening. DL: It is mind-boggling to me. 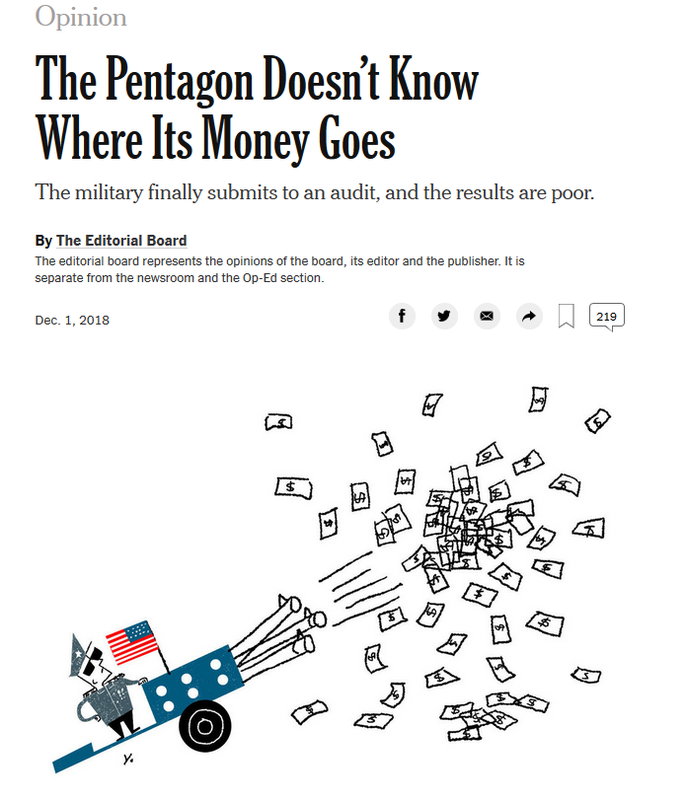 The inability to accurately track how money is spent makes it impossible to know whether precious resources are going to the right places, undermining the Pentagon’s ability to be successful in its far-flung missions around the globe. DL: …without being able to know how to spend the money. DL: Well, I think they know how they spend the money; I think they just don’t want us to know, and the press to know, and they don’t even want Congress to know. They’re in violation of the Constitution. They aren’t reporting to Congress as required. They aren’t returning money that isn’t spent, as required by Article 1 in the Constitution. But this has been 26 years that they have been saying, “it’s our legacy systems,” and believe me, back when I was using a Kaypro computer, 26 years ago, they’d have the money to have long ago bought, I don’t know, five or six Watson computers, and have the whole thing taken care of. The idea that they would say, “We still have legacy systems,” after 26 years of saying, “We have legacy systems,” is laughable. JJ: It doesn’t pass the laugh test. Well, I pulled you off it earlier but I did want to ask what your response was to corporate media haymaking over Rep. Alexandria Ocasio-Cortez, who, in a tweet, made reference to the $21 trillion that we’re talking about, that’s unaccounted for, and made a mistake in suggesting that that was existing funds that might be turned to something else. But as a reaction to this information, I just wondered what you made of that kerfuffle. DL: Well, it’s really interesting. She picked up on the story, and she tweeted out that there was $21 trillion in missing funds at the Pentagon, and she noted that that would be 2/3 of what people are saying it would cost over ten years to have Medicare for All. Her point is valid to a point, in she’s right about the amount. She was wrong about saying that it is missing money. It’s not a pot of money, although Mark Skidmore says we don’t know what it is, and it might be a lot of missing money, but we don’t know that. And that’s where she got caught being in error. I would have given her maybe one Pinocchio instead of four that the Washington Post factcheck column gave her, because she did get the $21 trillion right, and it is a huge amount of unaccountable funding that the Pentagon is putting in its books. But I give her a lot of credit for getting the $21 trillion reported on in the Washington Post, which has studiously avoided any mention of the stunning report that Mark Skidmore did last fall. None of the mass media has reported on that, so this is the first mention. 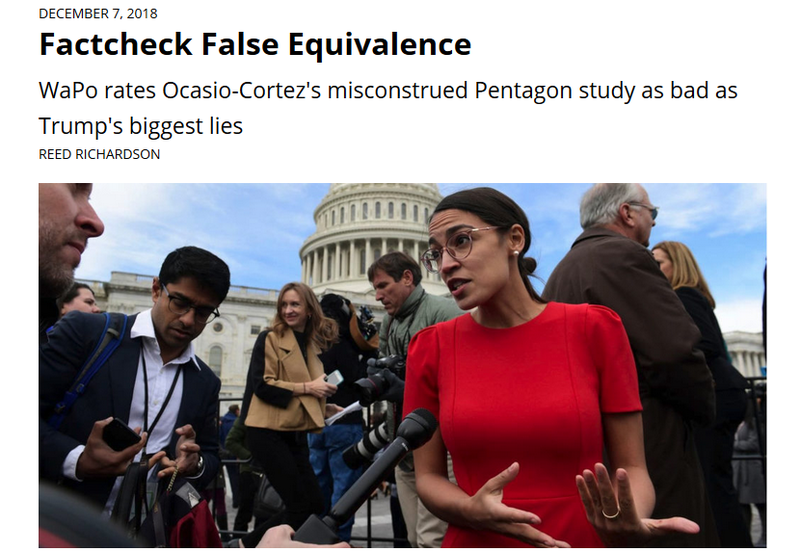 And as an aside, I want to thank Ocasio-Cortez for the factchecking, which has said that our article is correct, and that Skidmore’s study is correct. So the question is, why haven’t they reported on them? And also, why is it that after this Nation article has come out, and is being seen as well-reported and correct, nobody from the mainstream media has contacted us and asked for an interview? JJ: Which says a lot. DL: Unless you call NPR mainstream media; that’s semi-alternative. And then the rest are Pacifica stations and various independent stations, but no mainstream media. 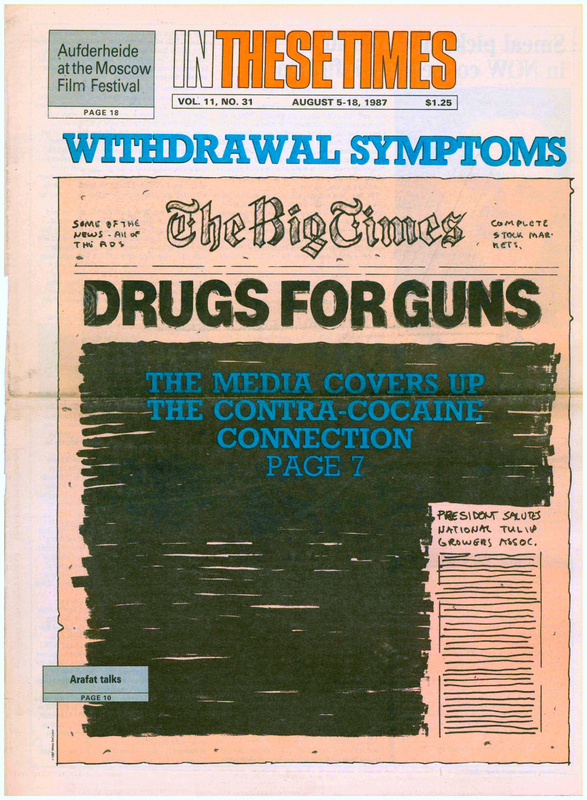 JJ: Well, at FAIR we oftentimes think about back in the late ’80s, when the New York Times‘ Keith Schneider was asked why the big papers were shying away from reporting the story of Iran/Contra, and he said, “This story can shatter a republic. I think it is so damaging, the implications are so extraordinary, that for us to run the story, it had better be based on the most solid evidence we can amass.” Which essentially meant, there is no amount of evidence that will be big enough. So in a way, the Defense Department defines “Too Big to Fail.” And in some sense, for corporate media, the story’s too big to tell. DL: Yes. It’s funny that you mention Iran/Contra, because one of the things that Chuck Spinney told me was that, what we’re learning is that one of the main reasons for these plugs in the budget is to allow the Pentagon to come into Congress and say, “Look, we spent all the money you gave us last year, and we need more.” When, in fact, they probably are not spending all the money they get each year, and then the money that doesn’t get spent, which by law is supposed to be returned to the Treasury, gets—they have a term for it—it gets “nippered” away from the category it was in, and moved to five-year money in other parts of the budget, where it gets hidden away, and becomes a slush fund that the Pentagon can use for black projects and other things that it wants to use it for without any observation. And when he mentioned that possibility—and other people had mentioned it—Chuck said that this actually happened before, in the ’80s, and was exposed by him and other whistleblowers. And what they had done back then was overstated the amount of inflation when they were asking for their next year’s budget. You might remember, that was a high-inflation period, but it never got over 10 percent, even for a brief period of time. They were slapping on 30 percent adjustments for inflation in their budget requests. And then, when it didn’t get spent, they would shunt it over to something called a merged surplus account, which was black money. And Spinney said that he and his whistleblowing colleagues think a bunch of it went to fund Iran/Contra. The total of it was something around the order of $60 to $100 billion in that merged surplus account. And when [then-Secretary of Defense Casper] Weinberger was called into Congress, when they used to do real investigations, and asked where the money went, he said, I don’t know. JJ: Finally, we know we need to shift something in media where they recognize that, first of all, Pentagon numbers — we just don’t think in terms of trillions and billions; they have to be contextualized, they have to be put in terms of priorities: What else could we be doing with that money that we often hear we can’t afford to do? But then, on a more fundamental level, I think something in the media and also in the public needs to shift, where we recognize that we have a right to know this information. DL: Absolutely. And one of the things about this story that I got right at the end is that this body called the Federal Accounting Standards Advisory Board, which sets the rules for federal accounting, approved a guideline that they had had proposed in the summer, and went through a 90-day comment period. And that guideline says now, effective October 4 and effective for the 2018 year that was being audited at the Pentagon, they said, if you have classified budgets, you can fake the numbers in those budgets, and you can move some things you’re funding out of the classified area into some other area where it won’t be discovered. So basically the new guidelines of the FASAB are basically legitimizing what the Pentagon’s been doing for the last 26 years, of making up numbers and hiding parts of their budget from any oversight. So unless something is done about that by Congress, unless they raise holy hell and say, “No, you can’t do that,” that’s going to be the norm. JJ: All right then. Well, there’s lots more we can talk on, and I think we will, but we’ll end it there for now. We’ve been speaking with reporter Dave Lindorff, among other things, a founding member of the online newspaper collective This Can’t Be Happening.net. You can find his exposé on Pentagon accounting fraud exclusively at TheNation.com. Dave Lindorff, thank you so much for joining us this week on CounterSpin. DL: Thanks for having me.